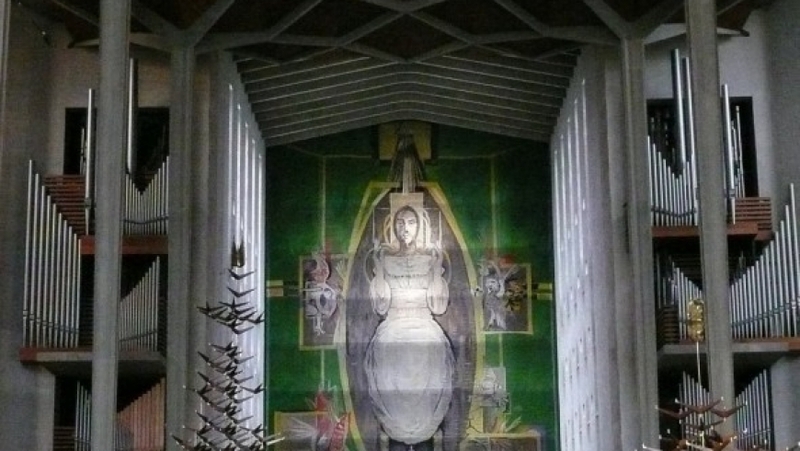 This exhibition brings together for the first time the original work of those involved in the design of Coventry Cathedral and its furnishings. Following the ruin of the fourteenth century cathedral church of St Michael’s during the air raid on Coventry of 14 November 1940, the city commissioned a new cathedral. The exhibition charts this undertaking, from the rejected designs of Giles Gilbert Scott to the architectural commission eventually won by Basil Spence and the commission of the tapestry, the windows, sculptures, vases, candlesticks, lectern and vestments from artists including Ralph Beyer, Geoffrey Clarke, Hans Coper, Jacob Epstein, Einar Forseth, Elisabeth Frink, John Hutton, Lawrence Lee, John Piper, Graham Sutherland and Margaret Traherne. The exhibition was curated by Louise Campbell of the University of Warwick History of Art department who has researched the work of Sir Basil Spence and by Katharine Eustace, Curator of the Mead Gallery.